The product is usually praised for the fact that it delivers a very good one-hand maneuverability and it also delivers a very smooth ride. Another great thing about it is that it does have some really good safety features and it won’t eat up a lot of space either. It’s a perfect model for those that want quality and reliability in one complete package. There are some customers that dislike the quality of the sun canopies. Another thing disliked by a few customers is that the product doesn’t have a cup holder and that the front seat doesn’t fully recline. 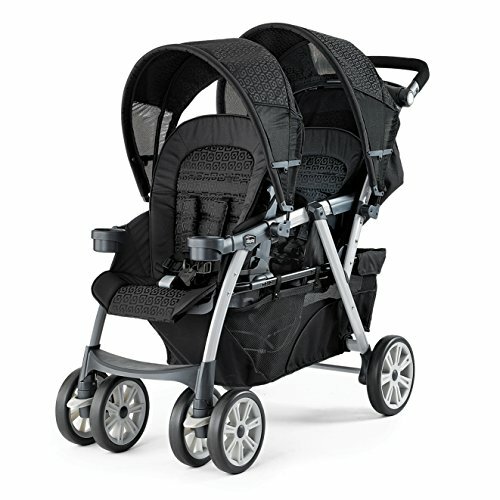 If you want to get a good stroller, the Chicco Cortina Together is certainly right up your alley. It’s a solid investment despite its few downsides and it can be a delight to use for sure. You should consider giving it a try, as results can be very well worth it! Chicco Cortina is widely known for being a very good stroller, but the downside is that having 2 kids would require you to purchase 2 of them. 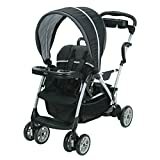 Thankfully, the Chicco Cortina Together was created to eliminate that problem and it does come with some very interesting features as well to make it one of the best double stroller for toddlers. One of the main benefits of the Chicco Cortina Together is that it helps you configure the seating in 4 different ways. Not only does it provide you with a great way to use siblings of a different age, but it also makes it easier to handle at all times! The wheels are offering a very good maneuverability and that alone makes it a delight to use. At the same time, the braking system is created from a one touch breaking bar. You will be able to access the brake really fast, so you don’t have to worry about any type of problem in this regard. Brakes worked very well and handling the Chicco Cortina Together is a delight. So the value is really good here. You also have an adjustable harness if you want! You will find mostly polyester on the upper side to keep your kids safe, otherwise the model is created mostly out of plastic and it also features some steel. It manages to seamlessly combine all these materials in order to create an amazing experience! Wheels can make or break any double stroller. The 9-inch rear wheels are very powerful and you can get optional locking wheels in the front. It’s not an all-terrain stroller, yet it can do wonders in many situations like that. So you might want to consider it for that reason alone. The weight limit for the seats is 40 pounds per seat. Basically, this model can accommodate any child under 5 years of age. These seats are 12.5 inches wide and they do have quite a bit of room. They are also very comfortable. An important thing to note is that these seats will recline all the way, although the frontal one will support only a slight recline. The design for this Chicco Cortina Together model is amazing. You will like the fact that you can fold it and then use the level to carry it around. This does help with storage. Its looks are great and the model does a very good job when it comes to being distinct and visually interesting. They also added some extra storage space so you can add in groceries and other similar products. That alone makes the product versatile and a delight to use! As we mentioned earlier, you have a touching bar that will trigger immediate brakes and you will also have the ability to use a 5-point adjustable harness. The wheels are very powerful, rugged and they will help deliver the extra help you might need even on the rugged terrain. You basically get a very good value for your money and that’s what matters the most! Just like many other double strollers out there, the Chicco Cortina Together does come with its own pros and cons. 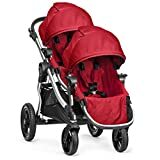 If you want to get a good stroller, the Chicco Cortina Together is certainly right up your alley as one of the best double stroller for toddlers. It’s a solid investment despite its few downsides and it can be a delight to use for sure. You should consider giving it a try, as results can be very well worth it!